Last week we started on a series geared towards new designers getting connected to the design community with an article on designers on Twitter. This week we continue the series with a look at great design blog RSS feeds to follow as well as some tips to consuming large amounts of content. For more information on RSS, check out this RSS in plain English video. It provides a great overview and will help get you started. The first step in taking advantage of RSS is by signing up for an RSS reader.¬† While their are many to choose from, my favorite has to be Google Reader. If you have a Google account it makes subscribing, reading, and organizing easy. Once you’ve signed up for a reader, the next step will be to find the feeds. 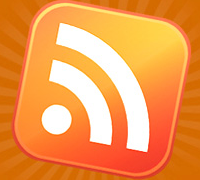 You’ll want to look for an RSS feed icon on various blogs and news sites. Many browsers will also provide you with icons directly in the browser bar. Clicking these icons will take you to the actual feed page where you can subscribe using whatever reader you like. You can also load feeds directly into the reader if that is more convenient. I find that my subscription list can get quite out of hand sometimes. At last check, I’m subscribed to over 250 blogs and the number grows every day. There is no way one person can consume that much information. Here are a couple tips to help make sense of the pile of feeds that you’ve gathered. Segmenting your RSS feeds is a great way to quickly get to the content you want to read. Most RSS readers will allow you to move feeds into folders or tags so you can group related blogs together. Two great methods for organizing are categories and priorities. Category grouping puts similar blogs into a folders with relevant titles. I’ve done this with many of the feeds I consume. I’ve got a category for design blogs, design galleries, apple/mac, business/marketing, tech, and sports. Whenever I’m in the mood to read on a particular category, regardless of the specific source, I can quickly jump to the folder and start reading. Another methodology for sorting feeds is based on priority. Under this sort order, you place blogs together that are must reads (high priority) and blogs together that you really don’t have to read (low priority). I use this for my 150+ design blogs, breaking them down into three categories: A, B, C. I’ll spend most of my time reading each and every article in category A while I barely scan through the titles in category C.¬† It seems to work out great and helps me get to the content I really value. Another tip for getting through a large amount of material is filtering out some of the junk. Every time I open my reader, I’ll quickly scan the titles and if anything grabs my eye, I’ll star it (a Google reader function) for later. Then I’ll empty out my reader and go back to the starred material. Sometimes I may miss some great material because an article doesn’t “catch my eye” but in this day and age, if you’re not writing good post titles, you may want to focus on grabbing readers attention. After I read each post, I’ll decide if there’s anything worth doing with this article. Should I share it on Twitter? Should I file it to write a post? If there’s a specific action that needs to happen, I’ll make a note or move the article to somewhere more permanent (bookmark, email, etc. ).¬† If not, I’ll delete it and move on to the next one. Sorting through and reading hundreds of articles a day is no easy task but as a designer I feel that constant learning is a must and I have to be able to stay up on trends and news. The RSS process I’ve described is well worth the time and effort. With RSS explained and the tips lined up, it’s time to start consuming some great blog articles. These 75 blogs are not the only blogs that you should be reading but they do offer a great starting point. I’m sure I’ve left on some truly great sources of information. If you’ve got others to recommend, please let me know in the comment section below. I also want to recommend another great list of blogs that are more business related but still very relevant to designers. These 16 blogs to help you master the business of design are all excellent sources of marketing, business planning, and other important tasks that designers should understand. Add them to your reader as well.